US Sen. Chuck Schumer has called on the Federal Aviation Administration to put out rules governing the use of unmanned drones following two recent instances of drones violating a New York airport’s airspace. Schumer pointed to two separate incidences when drones approached passenger aircraft as they were landing in southern New York. In August, an unmanned drone was seen hovering in the airspace near the Westchester County Airport – the same airport that President Obama reportedly flew into that same month while on a fundraising trip – Schumer told reporters Friday. In September, airport staff and a pilot reported a drone entering the airspace of an aircraft attempting to land at the airport. 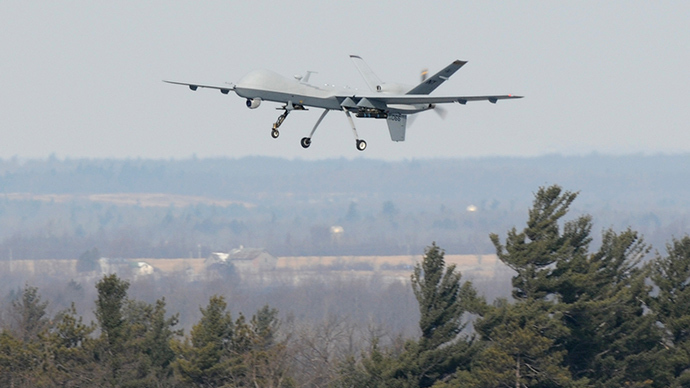 Two months later, pilots reported seeing drones near John F. Kennedy Airport. Since 2009, there have been 23 accidents and 236 incidents rated as “unsafe” by the Federal Aviation Administration (FAA). These incidences all involved drones operated by civilians, Schumer said. He said that while the drones are usually small, they can inflict severe damage if they collide with an aircraft’s engine or windshield. As this technology becomes even more popular among consumers, the need for rules regulating its use is unavoidable, he said. Drone use has been spreading like wildfire across the US. In June of last year, the US Federal Aviation Administration (FAA) approved a license for commercial drone flights over land for the first time, with BP energy corporation and drone developer Aero Vironment receiving the green light. In September, six movie making and television companies got the go-ahead to use drones for filming after the FAA endorsed their requests for exemptions from a ban on commercial drone operations in the US. Schumer has called on the FAA and the federal Office of Management and Budget to take action. The FAA said it was working on the new regulations. "It is our goal to get the proposal right," the agency's statement said. In groundbreaking decision in November, the National Transportation Safety Board (NTSB) said the FAA is authorized to enforce regulations against the reckless or careless use of manned aircraft, as well as unmanned aircraft, large or small.